This mola blouse has front and back panel, The Kunas believe on Constellation and they represent them in the molas, the star, moon and sun is depicted in this beautiful mola blouse with vibrant colos and fine stitching, when you purchase this blouse, you will receive 2 beautiful molas and they differ a little, however both panels are based on the same theme, the difference could be on the colors that highlight each star. If you are interested, please request additional pictures. 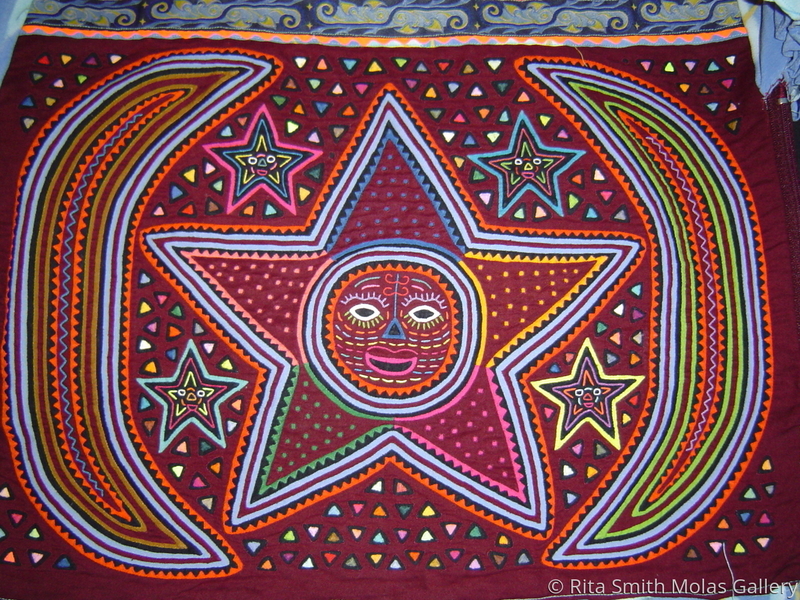 2 molas made this beautiful blouse the subject is Full Moon inside the Start, Moon and Stars. The Kunas are inspired by anything they see. Size: nearly 19" x 13 1/2"